The Langon Dot Print Shirt is a navy shirt with a white, micro-dot pattern. Pair this dress shirt with your favorite sport coat for a more dressed up look or style with your favorite jeans for a cool, casual look.This ultra-lightweight shirt is constructed from 100% cotton poplin fabric, sourced from Europe’s finest mills. Features a Ledbury Spread collar and double-barrel cuffs with reinforced buttons. 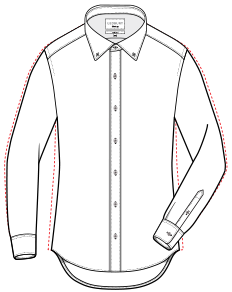 Tailored fit features a darted back for a more tailored fit around the torso.